A surprise move has been made by the Conservatives to allow large firms to use apprentice levy funds to pay wages – in a manifesto retaining the commitment to 3 million starts by 2020. The document, launched this morning, also commits to a major review of tertiary education funding, which it is thought could review the future of advanced learning loans. 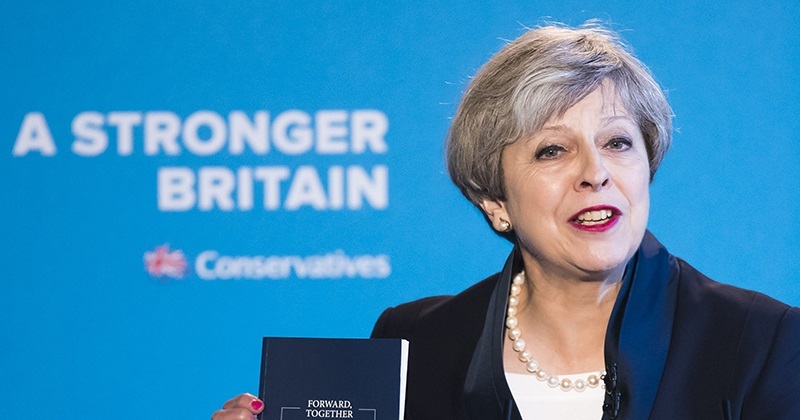 But no commitment is made to expanding university technical colleges, in stark contrast to the party’s 2015 general election manifesto. As part of a pledge to introduce a national retraining scheme, this year’s document says: “Under the scheme, the costs of training will be met by the government, with companies able to gain access to the apprenticeship levy to support wage costs during the training period”. The pledge will add further strain on the levy, which is also expected to fund apprenticeship training in companies not subject to the charge. And it remains unclear whether this would prioritise young apprentices, given concern as reported in FE Week that employers would shun them over older and more experienced candidates. There is nothing mentioned about how the Conservatives plan to support skills training for small and medium sized enterprises. It follows concerns over providers receiving much-reduced allocations for delivering apprenticeships to smaller non-levy employers, for the next eight months. Mark Dawe, chief executive of the Association of Employment and Learning Providers, said he was “a little concerned” about the wages pledge, and lack of apparent support for SME apprenticeships. “The levy is going to transform skills and productivity among large employers, but growth in the economy is heavily dependent on SMEs. We must ensure that enough funding from whichever source is being directed towards supporting the apprenticeships of these businesses,” he said. And David Hughes, Association of Colleges chief executive, said the proposal “has merit”, although he warned that it “must not result in employers reducing their own training spending”. A Conservative party spokesperson said the party believed the levy funds “should be sufficient to support wage costs”. Today’s manifesto includes a promise to “deliver on the commitment to create 3 million apprenticeships for young people by 2020” – the same target it set two years ago. There is a commitment to “launch a major review of funding across tertiary education as a whole, looking at how students can get access to financial support that offers value for money, is available across different routes and encourages the development of the skills needed as a country”. James Kewin, deputy chief executive of the Sixth Form Colleges’ Association, was “delighted” the Conservatives had promised to carry out this funding review. “This should focus on the growing gap between the funding made available to educate sixth formers and the actual cost of delivering an academic curriculum,” he said. FE Week has asked for further details about this review, and whether it will focus specifically on advanced learner loans, but has not yet received a response. Take-up on advanced learner loans, first introduced in 2013, has been slow, with the system open to fraud. There is no mention in the manifesto of troubled UTCs, which have struggled to attract sufficient learners to their post-14 recruitment model, in contrast to the 2015 manifesto which said “We will ensure there is a UTC within reach of every city”. The Conservatives have though committed this time to “introduce significantly discounted bus and train travel for apprentices”. That comes after a pledge by Labour to cover apprentices’ travel costs dropped off its published manifesto, after it appeared in a draft version leaked to our sister paper Schools Week. The Tories have also promised to double the Immigration Skills Charge from £1,000 to £2,000. This is a charge, introduced in April, on employers that take on skilled workers from outside the European Union, and will be invested in “higher level skills training for workers in the UK”. FE Week has asked the Conservatives for more detail on its election pledges but has not yet received a response.